The station is located in Building 208 at Johnson Space Center. Building 208 is located at the east end of the north parking lot of the Gilruth Center, the employee’s recreation center. The shack is located in the center of the building and features a back door. We share the building with Lunarfins, the SCUBA club here at JSC, the grounds-maintenance garage, the umpire/referee room, a concession stand, and restrooms. The club room has about 500 square feet of floor space. 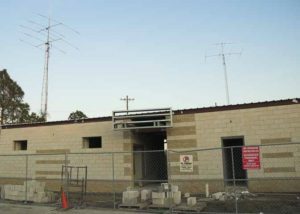 Around mid-March 2007, the building housing the W5RRR station, the JSC Lunarfins scuba club and the grounds-maintenance garage was demolished, the slab broken up and removed. 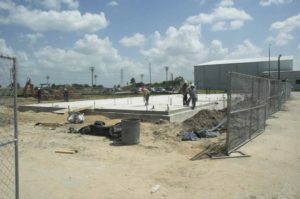 A new slab was poured and the building constructed. It took a while longer than expected due to a couple of hurricanes and heavy rainy seasons. 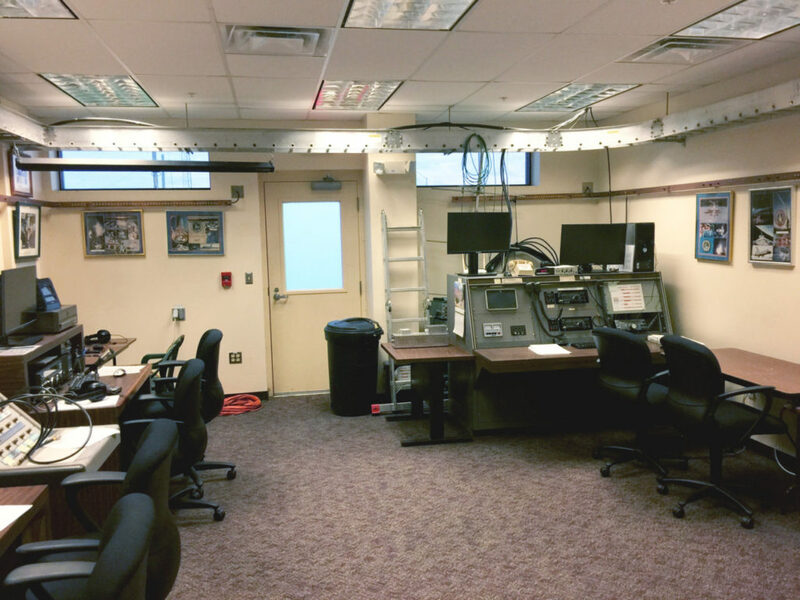 Like our old facility, the club station has a satellite VHF/UHF operating console, 3 HF and 1 VHF/UHF operating tables. The floor was carpeted; however, after Hurricane Harvey it was decided to tile the floor. Additionally, a fresh coat of paint was added to the walls. All cable runs are made in a cable tray around the perimeter of the room about 18″ below the ceiling. 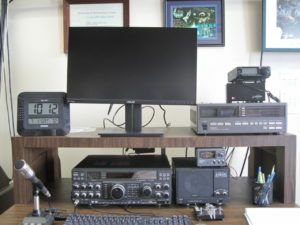 All stations have N3FJP’s Amateur Radio Software. We use this software for general and contest logging. The only station in our repertoire of HF radios without an amplifier is the Icom IC-781 HF transceiver. It once had an awesome matching amplifier: the IC-4KL, a 1,500 watt, autotune amplifier. It was the workhorse station for the club for many years. Sadly, a ‘black-box’ power supply in the amplifier failed and Icom service department could not repair it. Due to an admin error at Icom, they also determined that we should never have received that particular amplifier in the first place and refused to return it to JSCARC. 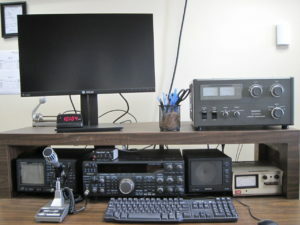 This station is a great CW station to operate. Semi-automatic antenna tuning of the transceiver and the amplifier make this station an easy and reliable station to operate. The matching FL-7000 amp is a solid state linear pumping out 500-700W output. 3. 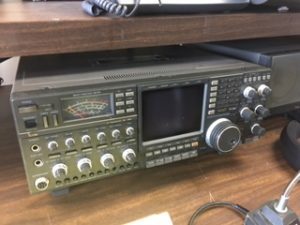 The Kenwood TS-950SD/TL-922A station. This is our most powerful setup. It’s a super performer dishing out CW and SSB QSO’s. The TL-922A dishes out a solid 1KW output, driving two rugged 3-500Z finals. This station is also currently the only station that has a digital SignaLink USB Sound Card interface. The IC-275 transceiver is an all mode 2m rig supporting USB, LSB, FM and CW. Extended receive is from 138-174 MHz; output is 25W. The Icom IC-475H is a 440 MHz all-mode transceiver with 75 watts output. It is very similar in features to the Icom IC-275A. The Kenwood TS-2000 is an all band HF/VHF/UHF transceiver with exceptional features and versatility. Wide band Main HF reception includes: 30 kHz-60 MHz. On VHF/UHF you get: 142-152 and 420-450 MHz. 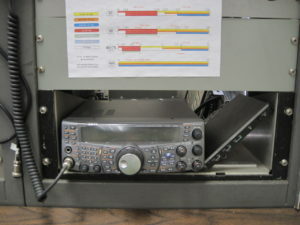 1240-1300 MHz is featured in this TS-2000X model. Sub band (AM/FM modes only) reception includes: 118-174, 220-512 MHz. Output is 100 watts on HF, 6 meters and 2 meters. 50 watts for 440 MHz. A built-in TCXO ensures excellent stabililty. Because of our involvement with Shuttle Amateur Radio Experiment (SAREX) and Amateur Radio onboard International Space Station (ARISS), the VHF/UHF satellite console had logged quite a bit of the interest, activity and attention in the station. The console housed three transceivers, a couple of power supplies, VHF/UHF amplifiers, TNC’s, the AZ/EL rotator controller, etc. The VHF/UHF console had a lot of history associated with it. It was from this console that the first earth-space amateur radio contacts are made during SAREX-manifested Space Shuttle flights. 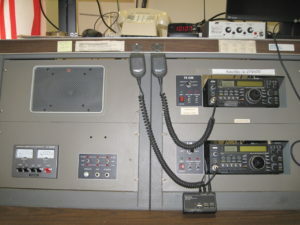 Typically, one or two radio checks are made with the astronauts prior to their onboard amateur radio operations: contacts with the scheduled school groups and general DX-style contacts. Since those early days of SAREX with Drs. Owen Garriott (W5LFL), Tony England (WØORE), and Ron Parise (WA4SIR), many, many contacts were made with astronauts and cosmonauts from this console. During the times when U.S. astronauts were stationed aboard the Russian Space Station Mir, there were almost daily contacts with Mir from W5RRR. The astronaut got a chance to speak with family members, friends, and co-workers staying up with what was going on on the ground in their absence. Future activities from this console, or whatever it may evolve to in the future, will certainly include communications with the International Space Station crewmembers. The equipment is assembled, the antennas have been designated, constructed and assigned their outside mounting locations, and the astronauts/cosmonauts have received or will receive their licenses. We have been blessed in the past with great antenna/tower systems. The first is our 80′ Rohn 45G tower – it’s been a rock. 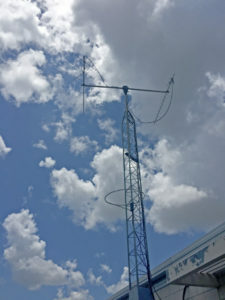 It’s been through hurricanes, thunderstorms, and, we believe, micro-bursts or mini-tornadoes (we had a 51′ crank up tower at one time which we lost in a sudden thunderstorm which reportedly contained microbursts and may well have caused the tower’s failure–but, the 80′ Rohn 45G tower suffered not a whit). On September 22nd, 2017 the 80′ tower received a face lift by getting several new tower sections, antennas, rotor, and coax/cable. 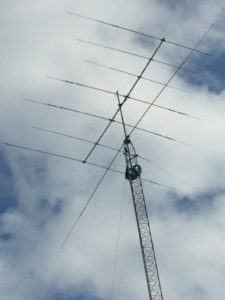 The 80′ tower supports a Hy-Gain TH-7DX (7-element, tri-band 10/15/20m) beam at the top of the mast and a Cushcraft D40 (rotatable 40m dipole) at the base of the mast. The tower has a parallel shunt fed wire along the outer rails and a Dentron Super Tuner inside a Harris RF 213 sealed enclosure at the base of the tower for 160m operation. 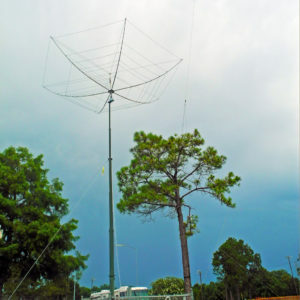 The tower also has a Radioworks Carolina Windom 80-10m wire antenna which runs approximately 130 feet from the near the top of the 80′ tower to a tied off spot 30′ up a tree due North West. We recently discovered large amounts of water inside the current balun which likely affected its performance for many years! However, it’s all fixed and radiating fine now. The beams are turned by Ham-IV rotator. The rotor controller is located at HF Station #3. The second tower (temporarily down) used to hold our Cushcraft A3S, a 3-element triband beam for 10-15-20m, an A3S+30m , a 3-element duoband beam for 12-17m with optional 30m add-on 8′ above it, and a dual-band VHF/UHF vertical antenna. It was a 50′ ex-military tower we received a number of years ago from the Ellington Field MARS (Military Amateur Radio Service) group. However, it suffered a fracture in one of the tower section legs. Because of the hazard and the potential for other fractures appearing, the tower was removed. A 60′ replacement tower has been acquired and is stored at the outside cage beside the shack, but is awaiting a new pad installation. Stay tuned. In the meantime, we’ve temporarily installed a 50′ AB-1339A/G military crank-up tower at the former tower #2 pad site. We have a KIO 5-band (6m-20m) Hexbeam mounted onto of it. Because the Hexbeam is so light-weight, it is easily be driven with a Radio Shack antenna rotator. The third tower is one straight section and one pointy-top section of Rohn 45G. This is our satellite antenna tower. The rotator is a Kenpro. The 2m antenna is a 24-element, cross-polarized, beam antenna. The 70cm antenna is a 36-element, cross-polarized, beam antenna. Work is underway to build an interface from our newly acquired NUC computer with the existing Yaesu rotator antenna controller. Tracking of the satellites and ISS should soon be a breeze. A 6m Halo antenna is mounted part way below the 2m/70cm cross-polarized antennas. The TS-2000x excites this halo antenna. This is another antenna generously on loan from John Maca (AB5SS). Arrayed around the walls of the station are numerous pictures and posters. 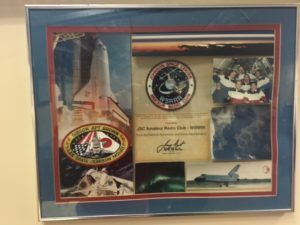 The space shuttle crew pictures were designed by the crews as mementos and tokens of thanks to those organizations and folks who supported them in their flights. Some of the posters are those which were used during public events such as space-related and ham-related conventions, in which the SAREX (and now ARISS) project was presented.